If there is a problem difficult to solve for the young of both sexes, it is that of love. Sooner or later, as they grow from childhood to adult age, they meet love, feel or observe the vehemence of the crises it raises in the human heart, and try to understand its nature and discover a line of conduct. Adults are hardly wiser; they are as much the plaything of the force that possesses them and seek for a compromise behaviour that would avoid disturbing too much their own existence and that of society. One of the peculiarities of the problem of love for the child is that he (or she) is left almost alone to solve it. He does not find in his class-books any indication about it, and when he turns to a parent, a teacher or an elderly person, the answers that he gets can only puzzle him more. Either he is signed to silence and told not to busy himself with such things: "the less one speaks or thinks of it the better it is." Or he is told that he will understand when "bigger" - which is a false promise; grown-ups are not wiser than children, they are only less struck by the newness and strangeness of love's manifestations. As to his talks with class- mates, it is best not to say anything! At times, rarely, a mother or a father will try to help the child out, but the answers they give are hardly understandable by the child. They raise new questions and the child is drawn along to a strange world, invisible but revealed by its effects in him and around him. In short, it seems as if everything were conspiring to stifle or repress the silent force, a force that no one can explain or master, but with which one has to come to terms and live. As the child grows, he realises that the problem of love is among the greatest concerns of the world. He sees that famous writers have heaped up volumes about it, in praise of its sweetness, or in blame of its violence or simply in describing its vagaries. His teachers have been obliged to speak of it, but none understands its nature. Later on, the child may come across a book pretending to throw some light on the problem. He is asked to analyse his dreams and make the Unconscious conscious. A dark sink opens before him; explanations do not satisfy him, they only bring him harassing and disconcerting thoughts. Finally, the child is led to acknowledge as a fact the existence in him, as in every living being, of a secret force that seems to originate and develop from the animal world. He has to control it, as best he can, and hide away its effects, whatever storms may rage within. And yet it ought to be relatively easy for us, disciples of Sri Aurobindo and the Mother, to give to such problems as children and adults meet in that domain an explanation which would satisfy them and throw light on what happens within them. 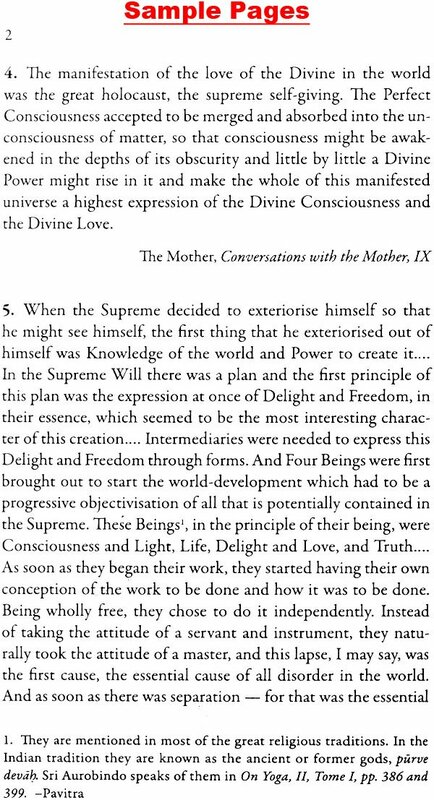 Sri Aurobindo and the Mother have in several places in their writings spoken of Love as one of the essential aspects of the Divine and as a fundamental principle of the universe-al-though still in large part veiled. The fact that Love is only partly revealed hides perhaps from us the role assumed by love in the evolution of the universe and of each individual being of the universe. A small key is required. 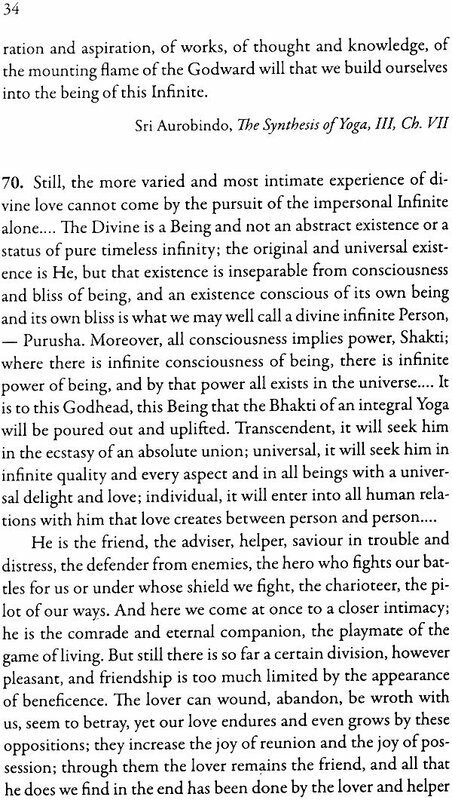 The Divine - simultaneously One and Many - manifests himself in the universe through separate centres of consciousness. Without Love these centres would remain eternally separate. Each would evolve in its own way, without deep contact with the others. What would be lacking to it is the consciousness of its identity with the Divine and of its underlying connection with the other centres. The aspect of the Divine that has taken upon itself the task of bridging this eternal opposition is Love. 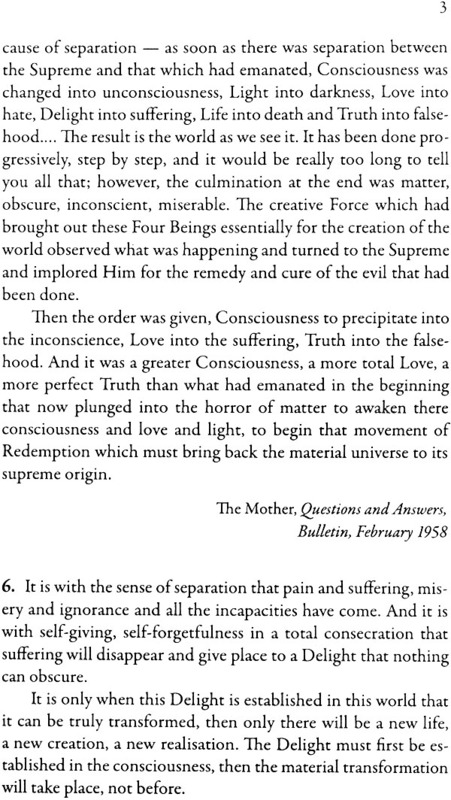 And love is, in the evolution of the universe, the hidden force that will accomplish the work. The careful observer - and such is the child - sees manifestations of this force everywhere. He marks its elementary forms in insects and the lower animals. They are then mechanical and reflex: sexual instinct and associative instinct (ants, bees); hunger is also a manifestation of love (one devours what one loves). Later on, his science books will teach him that attractive forces (and repulsive forces that are complementary) are indispensable to build up matter - the matter of physics and chemistry. Molecules, and even atoms and their constituents, exist only owing to the presence of certain forces that ensure their cohesion. Does not the Mother say that love exists - with consciousness - even in the stone? In the higher animals - birds, mammals - the mechanical and reflex action is modified by a nascent psychic element (rearing of offspring, faithfulness to a mate, devotion to the pack). Between the higher animal and man, the difference in this sphere is not large; it is in the growth of the mental element (reasoning capacity) that man differs mostly from the animal. Separation of sexes is but a device used by Nature to reach her own ends. It is not indispensable to the propagation of the species - many species are asexual or bisexual. But this separation is convenient and efficient. Now each human being - everyone of us - is evolving in the universe through a succession of many lives upon earth, and as the object of this evolution is the progressive awareness of our essential identity with the Divine - One and Many simultaneously - everyone of us will progressively become aware of the essential Love that is in him and of his bonds of love with the other beings. Then, instead of opposing eternally all others, each of us will feel a natural affinity with this one or that one. All throughout the ages consciousness grows as evolution progresses. One day, the individual being is at last ready to recognise in others the same consciousness that exists in him. He recognises others as his other selves; he recognises himself in others and in all. He can at long last understand the meaning of this passage of the Upanishad about the One Self or Spirit everywhere. With the help of these powerful and significant words it is possible to classify individual human beings in one or the other of two groups. Those of the first group - the outward path - find in an association with another individual a real help. For them, no problem; they follow instinctively the reactions of Nature in them, and it would be at once unwise and vain to try to change their reactions by advocating a higher path; they would not understand. Those of the second group - the return path - are more advanced in their evolution and feel strongly the attraction of the divine pole in them. For them, a longstanding association with another individual would be contrary to their spiritual des- tiny and to indulge in it would cause delay in the progress of their soul. They cannot commit themselves and alienate their deep-seated freedom. But the border line between the two groups is not clearly drawn. There is a large category of men and women evolving in a margin of incertitude. These become the seat of a prolonged and painful conflict between the two poles of their being, the human and the divine. But they have to move forward, at whatever cost. Yoga is a process that accelerates individual evolution. Through yoga those that are treading the return path and even those that are struggling in the zone of incertitude, may clear in one life a great part of the way and reach divine union. The fact of aspiring to yoga is a proof that one is treading the return path, or is quite close to it. 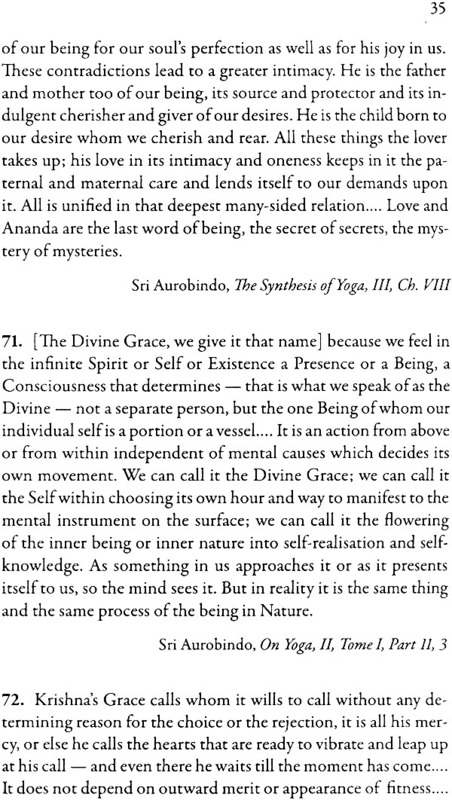 With this in mind we understand clearly why Sri Aurobindo and the Mother, speaking to all who follow yoga or aspire to it, repeat constantly that a "vital" or sexual relationship with an- other individual is one of the greatest obstacles on the way. This explains also why persons from outside - who do not follow yoga - get an impression when reading the works of Sri Aurobindo and the Mother that they reject human love, vital and sexual, for the whole of mankind. It is now clear that this is a wrong impression. If someone of the outward path consults the Mother in order to ascertain whether it is advisable to marry or not, the answer will in general not be negative. And her approval would hold all the more for the innumerable millions of men and women to whom the idea will never come to consult a spiritual leader about their marriage. These explanations should enable anyone of us, if he observes and studies himself attentively, to ascertain, at least roughly, where he stands on the long scale of evolution. He will not only be able to understand his instinctive reactions, but will also know that, whatever place he has now reached, he will tread the entirety of the scale and attain liberation. Fear drops out of him - that fear of standing forever condemned, contemptible, imperfect. He will be able to look at himself without losing strength and come to decisions accordingly. This is the light given to us by Sri Aurobindo and the Mother; it is a priceless gift. The following quotations will convince every person of good will.